After a long winter, it’s no surprise if your skin is looking tired and dull. Chances are, it’s crying for some well deserved TLC. Spring may be in sight, promising the sunshine and freshness that our skin needs to be it’s best, but it’s just not close enough! I’ve found a solution and it’s from one of my favourite skin care brands, Simple. 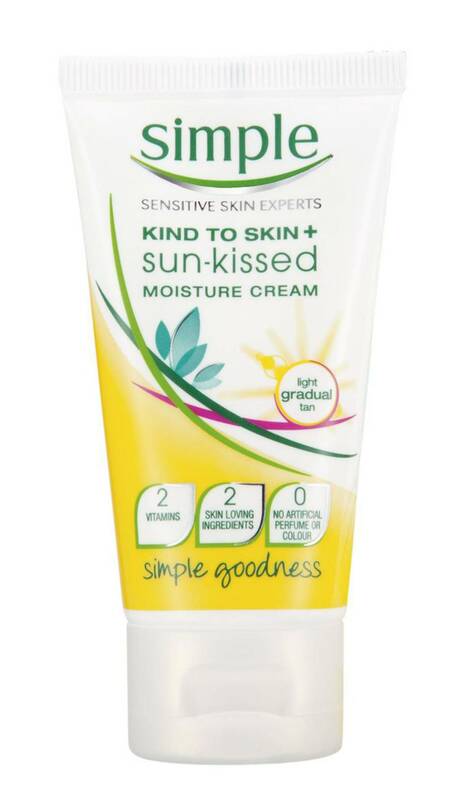 Simple Sun-Kissed Moisture Cream is a light moisturising face cream with vitamins, gradual tan and it’s kind to your skin. I’m not really one to use tanning products, but Simple Sun-Kissed Moisture Cream builds a soft natural glow rather than an obvious tan and leaves my skin feeling soft and ready to take on the world (or the hottie I spotted around the office)! I have very sensitive skin and feel no worry to use Simple, which refuses to use artificial colours, perfume or harsh chemicals. This product is a god send and will be part of my beauty routine until the sunshine arrives. Vary the amount of times you apply this moisture cream dependent on your skin tone. I have olive skin and use two to three times a week, but to all girls with lighter skin, it’s fine to use more!